I have HUGE plans for this evening. As a mum of a a 3 year old and a nearly 1 year old, I'll be in bed by 10:30, I'll sleep in the new year and be up at around 6:30. I'm such a partly animal aren't I! Despite my plans, I did put on something with a bit of zing. 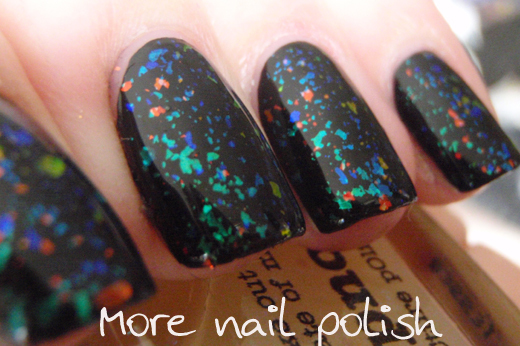 This is an older polish. 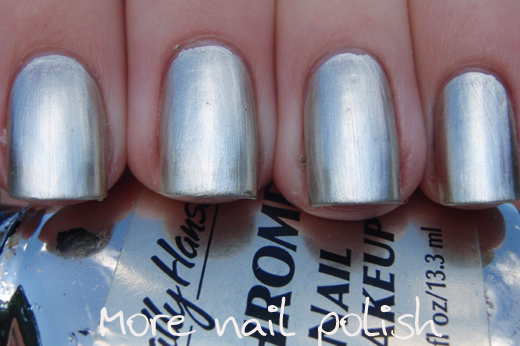 Sally Hansen Canary Diamond Chrome Nail Makeup. 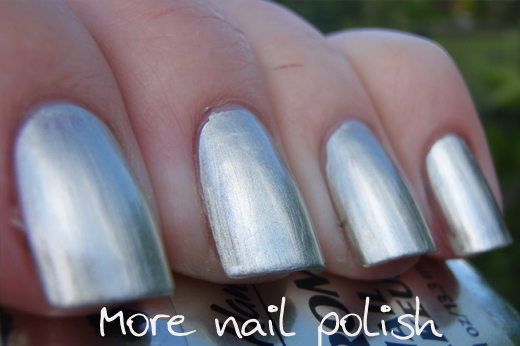 For some stupid reason, I never got China Glaze Millennium (I only got 2030), thinking I had a good enough silver chrome. This is nice, but I don't think it has as much of a mirror finish as Millennium. This was only one coat over Orly bonder. 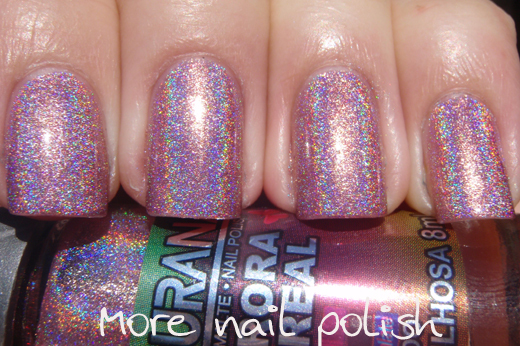 I like Orly bonder as a base for chrome polishes because it leaves a really shiny base. 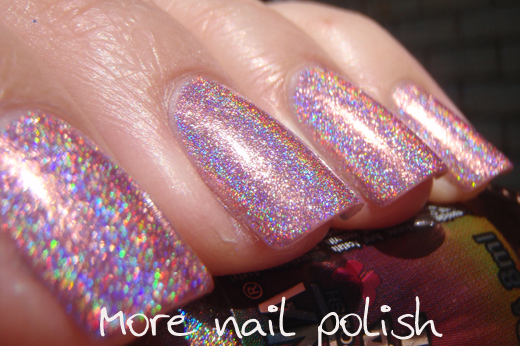 Chrome polishes always show every imperfection in the nail, so a nice shiny base helps it be smooth and glossy. 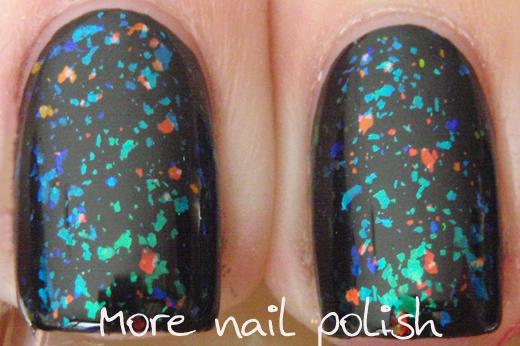 Here is the third Picture Polish flakie cover, Hypnotic. I think the flake colours that are in this are a teal green and orangey red. Then the teal green colour shifts to blue and the orangey red shifts to yellow/lime green. The teal green looks more emerald green in real life too, but my camera doesn't show that. This one seemed to been the least dense of all three, either that or I just couldn't pick up as many flakes on my brush. 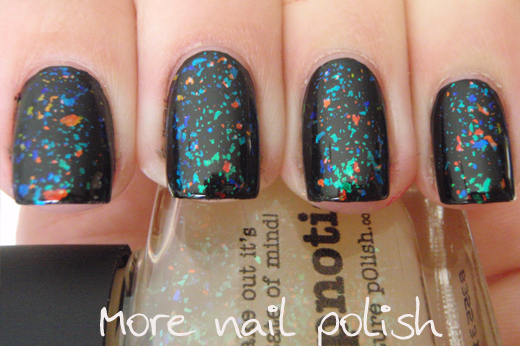 The bottle certainly looks just as dense as the other two polishes, just it just didn't translate to the nail. 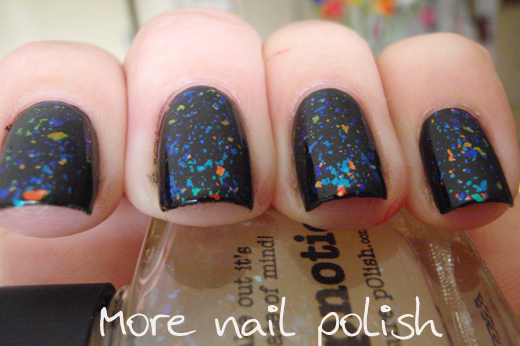 This is three coats over a black base, with Seche Vite top coat. It doesn't really need the top coat as it is very glossy and smooth, but I always put on Seche Vite when I'm wearing a full mani. 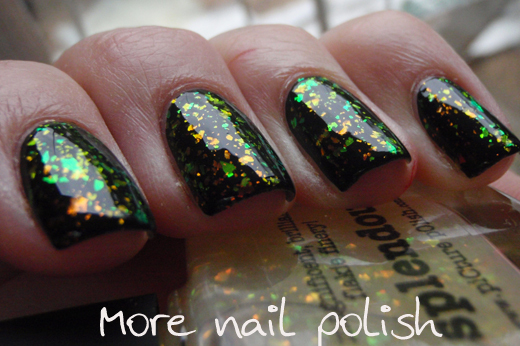 I don't think this needs to be said, but this is a totally awesome polish. I also think it is totally unique. I thought that Finger Paints Asylum might have been similar, but checking swatches of it I think it's much more blue, whereas this is green. 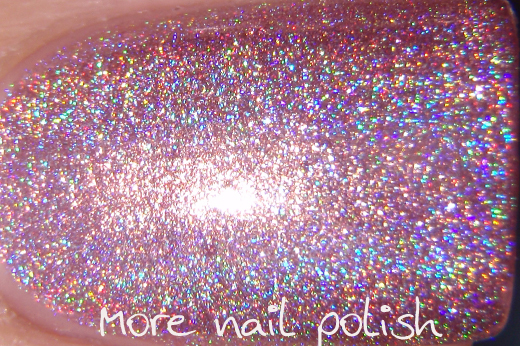 Today I have another brand new flakie cover from Picture Polish. 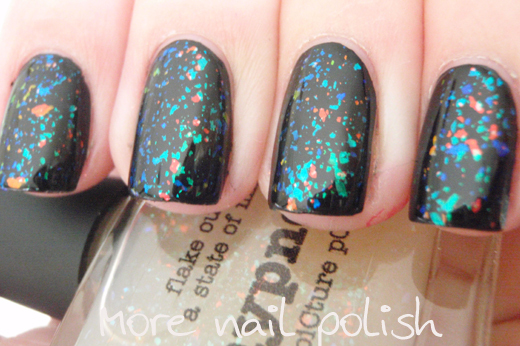 This little beauty is called Splendour and it's really gorgeous. 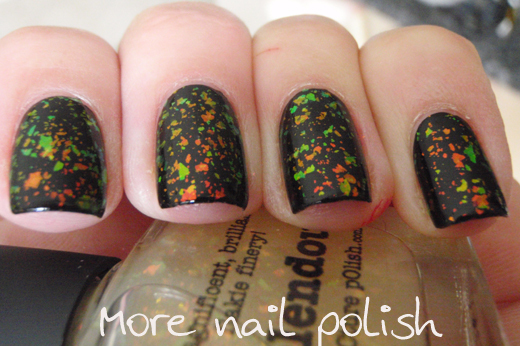 I think Splendour is made up of orange and green irregular shaped flakes of various sizes, but because it is has a strong duochrome colour shift that shows green, red and yellow, it's really hard to tell what colour the flakes are because it changes all the time. 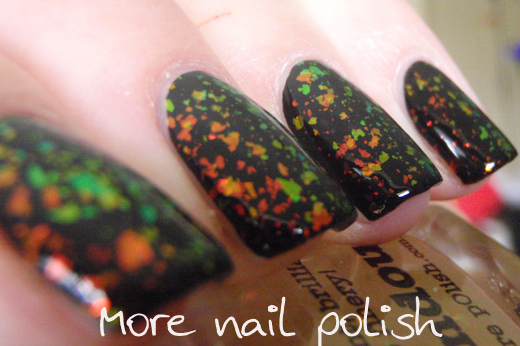 I found the flakies to be more dense in this polish than Festival, which is awesome. It meant I didn't have to go fishing for the flakes, they came up on the brush easily. 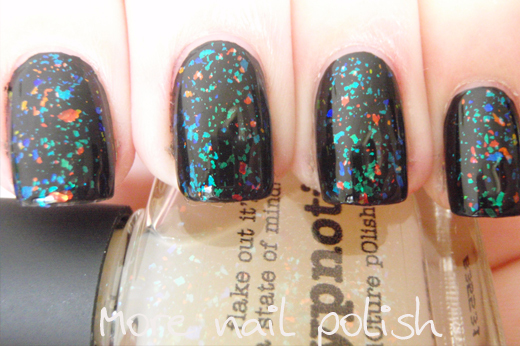 This also had a very smooth finish, you could get away with no top coat as it's super shiny. 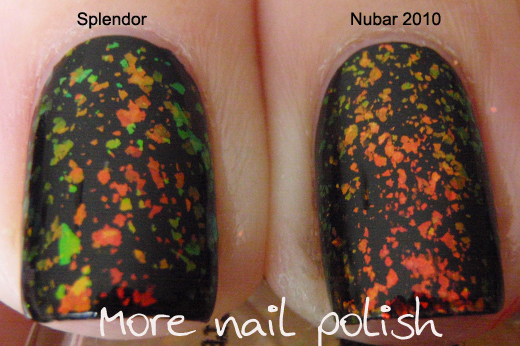 These photos show two coats of Splendour over black and one coat of Seche Vite top coat. 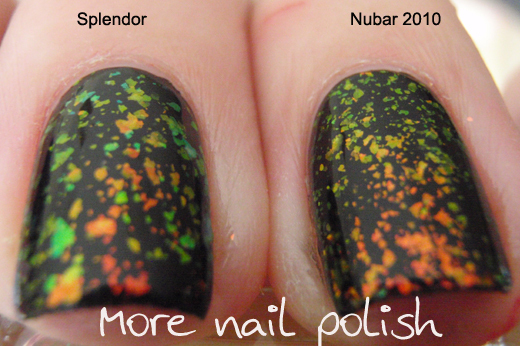 Colour wise, I thought this may be similar to Nubar 2010 (and Sally Hansen Hidden Treasure) and it's true that the colours are the same. But Splendour seems to have the addition of some green flakes, whereas 2010 really only has the orange flakes that shift to green. The flakes in 2010 are also smaller. I actually really love them both, but I think I slightly prefer the larger flakes in Splendour because they sparkle more. 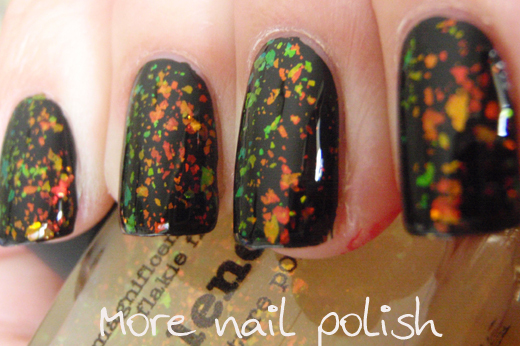 This polish looks like it would be similar to the new Finger Paints 'Flashy' polish, but again I think it only has the red flakes, not the extra green ones. 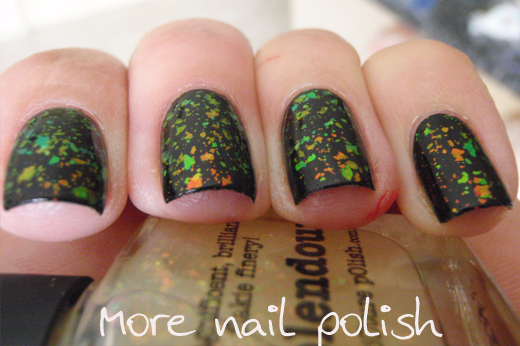 Here you can see the green shift of both polishes, but also how the green flakes in Splendour go slighly blue toned. 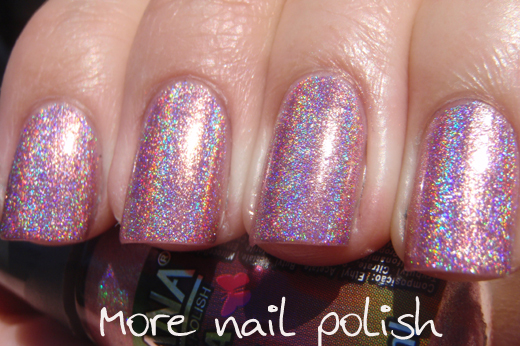 This is another totally awesome polish from the girls a Picture Polish. Correct me if I'm wrong but I think these are the first flaky polishes from an Australian brand. Aussie, Aussie, Aussie .... Yeah, you go girls! 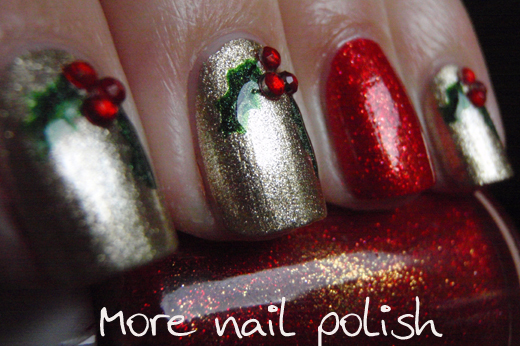 These polishes are a total winner. 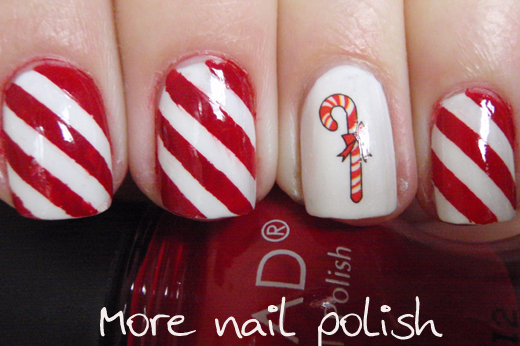 These cost $11.90 and are available from Picture Polish. Ladies outside of Australia may think that $11.90 is a bit pricy. But here in Australia, where OPI retails for $20, Chanel for $39 and Revlon for about $12, this is a comparatively pretty good price still, especially for a flakie that is otherwise only available from Inglot or Nfu Oh for close to $20. Here is the latest collection from Ulta3. Canberra girls, I grabbed mine from the chemist next to Coles in the Gungahlin town centre. 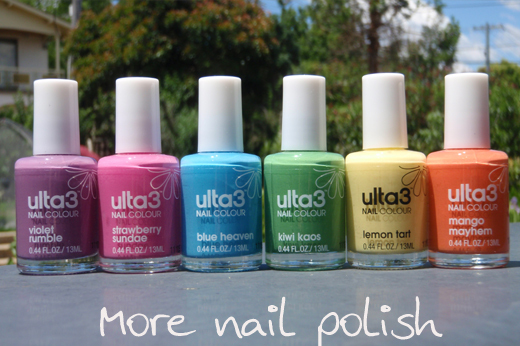 I was surprised to see another Ulta3 release this summer, given they released eight polishes in spring. Usually they only do two collections a year, maybe they are going to up that to one every season. I sure hope so. The Ulta3 gelato collection is a set of six creme polishes. They are not brights and they are not pastels, they are somewhere in between. First up is Violet Crumble. Arrrgggghhhh Violet Crumble *wipes drool from mouth* I can't remember the last time I had one of those. And now, damn I wish this polish was that metallic purpley blue from the Violet Crumble wrapper, that would have been totally awesome. Sadly it's not, instead it's dusty violet colour which is still pretty, just not awesome. This was three coats (and it needed all three!) 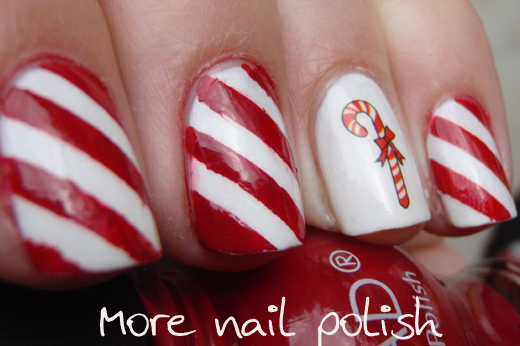 with no top coat. Blue Heaven. Oh yeah baby, this really is blue heaven. I totally love this one. There was a serious lack of decent blue cremes in the Ulta3 range, so this one fills a big hole in my opinion. This was three coats and a coat of Seche Vite top coat, again two coats were a bit streaky. Kiwi Kaos - I'm surprised to see a green in this collection, given that they did three greens in the last collection. This is a toned down green that is quite wearable, unlike the rather hideous Frog Prince. This was three coats with no top coat. I really shouldn't have been lazy on this swatch and added the top coat, cause it would have looked so much better with it. Lemon Tart - Very pretty light yellow. Streaky and horrible to apply. This was four coats with SV top coat, but once it dried it was great and very nice on the nail. 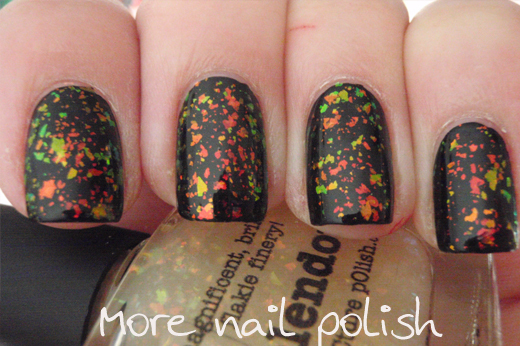 This is the last one I swatched and I wore it as a full mani. Mango Mayham - rich orange creme, but not neon or ultra bright like tangelo or tahiti. A unique colour in the Ulta3 range. With a name that includes the word Mango, I was expecting something more yellow, like mango flesh, mmmmmmm I have one on the bench I might go eat now! This was three coats with Seche Vite top coat. 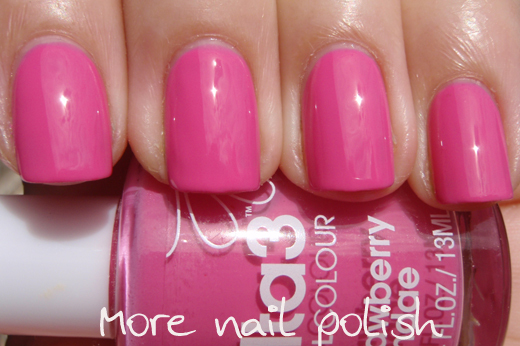 Strawberry Sundae - A medium bright pink creme. Ulta 3 have a stack of pink cremes so I'm sure it's similar to something they have already released, I'm just not sure which one yet. I'm not a huge pink lover, but I'm really feeling this one at the moment. The formula on all these was only OK. Very much like the last collection. Runny, but thick at the same time. I had a lot of trouble with the brushes from these polishes. The Ulta3 brushes used to be delicate and smooth, but I found these rather stiff. So much so that the brush left drag mark ridges through the polish as I wiped it over the nail. I had this same problem with the spring collection. I'm guessing they are probably using a lower quality brush now that the polishes are made in China, rather than made in Australia like all the previous polishes. Despite the weird formula and crappy brushes, I totally love the colours. I also love collections like these that just go together and look like a set. They almost did this with the Spring collection from 2009 which were almost a set of pastels, except with Hot Spring and Spring Break. Over all, yep they are totally worth their $2.25AUD price tag and are a great addition to my nearly complete set of Ulta3 polishes. 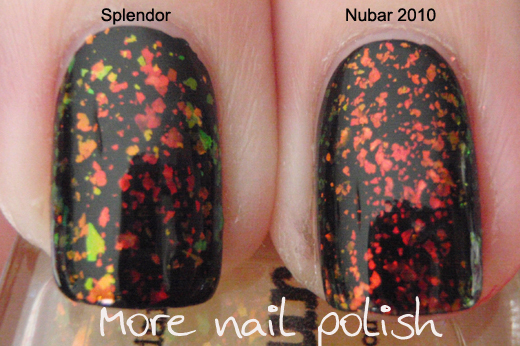 If anyone wants comparisons swatches just let me know what you want to see. Merry Christmas everyone. It's the end of Christmas day here and the kids are exhausted from 100% play all day. We've had a lovely day at home with the family, and will be off tomorrow to visit the rest of the family. 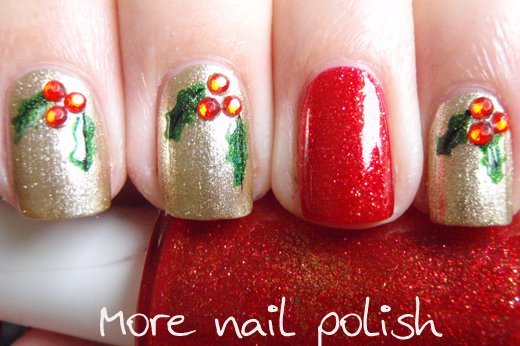 Here is my Christmas day mani. 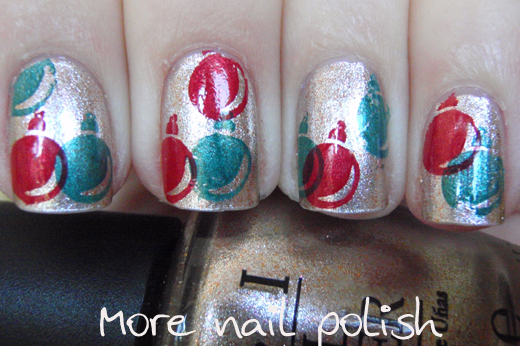 The gold base is Orly Luxe, I then painted holly leaves using a fine brush and the dark green holo polish I showed here. 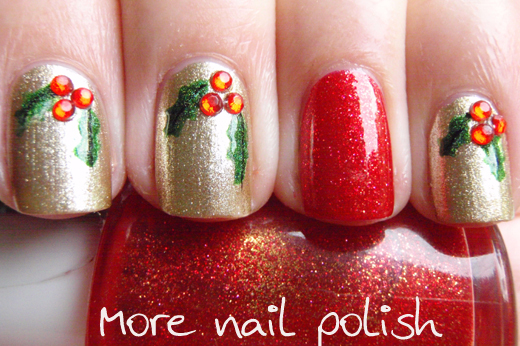 I highlighted the leaved with China Glaze L8R G8R and black and then added red gems for the berries. The accent finger is a pimped up bottle of Ulta3 English Rose, which I added a little extra red and gold micro glitter to. It's such a totally awesome red polish now. I love how the red gems glowed golden orange in the light. 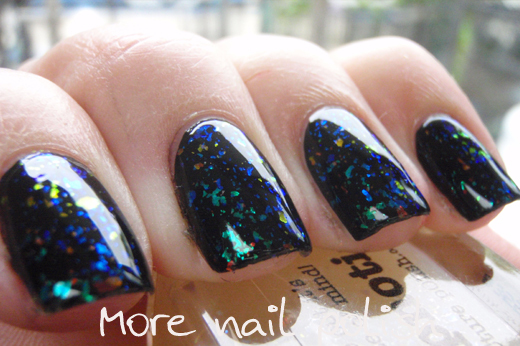 I totally loved this mani, and because I pressed the gems into the outer edge of each nail I hardly even fiddled with them, which means they lasted well. I hope you had a great day, or if your Christmas day is just beginning, I hope it is wonderful. Just a quickie tonight. Finally just got the kids to bed and still have presents to wrap before Santa arrives. 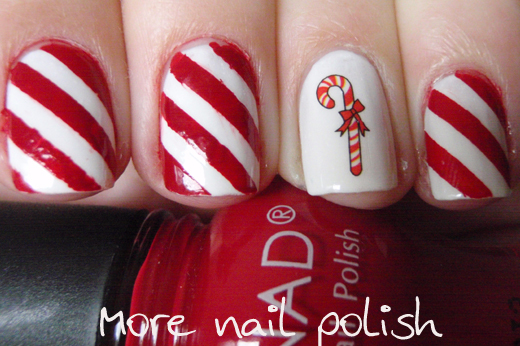 Here is a quick Christmas mani I wore yesterday. 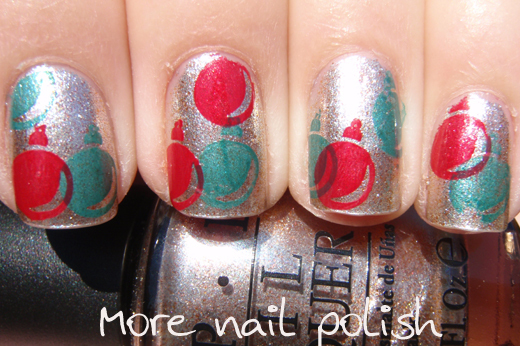 The base is OPI Designer de better from the Muppets collection. 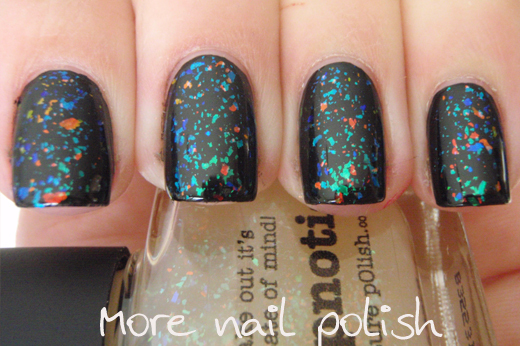 Totally love that polish which I just got in the mail on Friday. 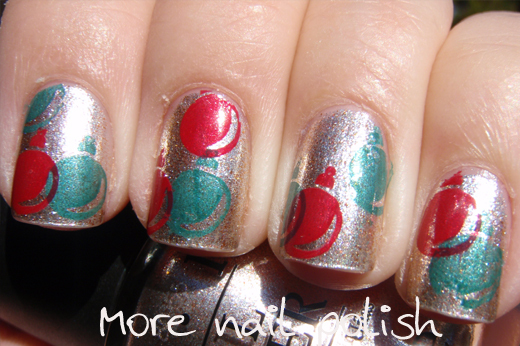 The baubles are stamped in Konad special polish in red and green, using the bauble image on the Bundle Monster plates. 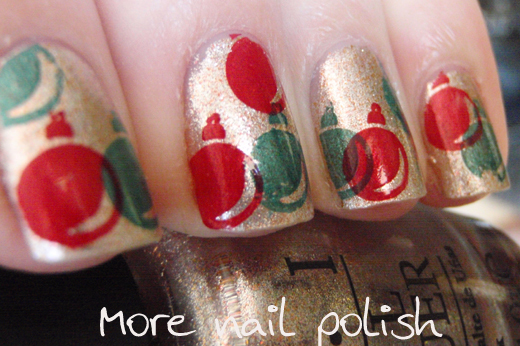 From a distance this mani looks nice a Christmassy, but up close I think they more look like upside down balloons. Goodnight everyone. I hope you all have a wonderful Christmas with your friends and families. Bad luck comes in threes right? I'm officially up to five, the last straw for me on Tuesday night was breaking a nail! Damn it! I'm now totally nubbinized with the shortest nails I've had for a few years. I've noticed a few girls sporting nubbins at the moment. Maybe it's cause of the time of year when we are all rushing around to get things done. I certainly know that is the case for me. I broke the nail on my car steering wheel. And you know what, I seem to break a disproportionate number of nails somehow relating to my car. Closing the door is a doozie for me, when you fingers slip off the door at the tip and flick, there goes one or two nails! 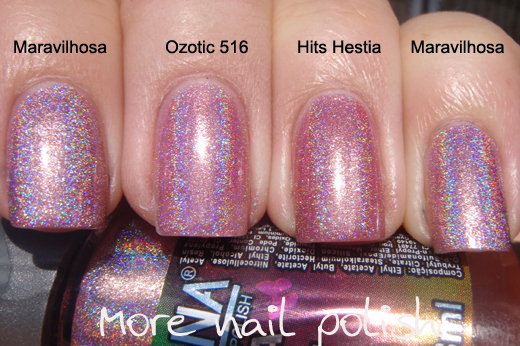 As you can see Maravilhosa is a blue toned light pink holographic polish with a chrome metallic base. 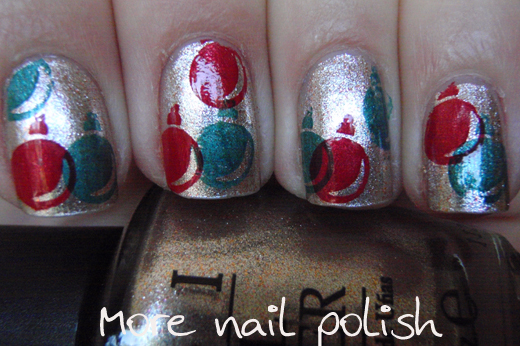 The formula for this was OK, but again I got some small bubbles on a few fingers. 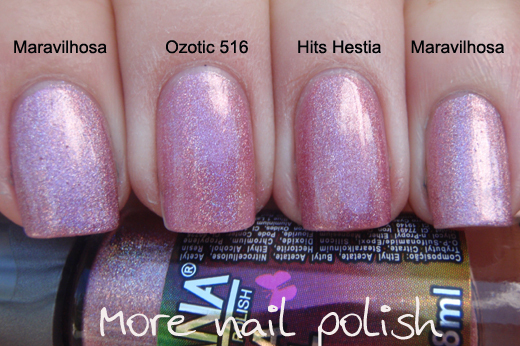 Here is a shade comparison photo with Maravilhosa, Ozotic 516 and Hits Hestia. 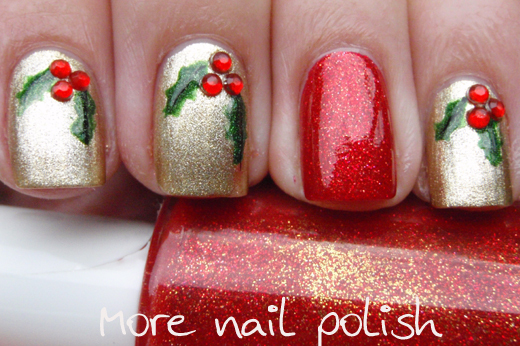 All three of these polishes are very very similar. 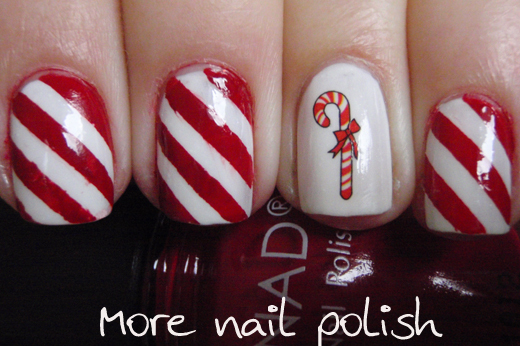 Quick, off to finish my current mani. Good night and I hope none of you break a nail!